These combined degree programs are designed for qualified students who are interested in pursuing a master's degree in addition to their undergraduate degree in political science, or economics. The programs are selective and target outstanding GW undergraduates. Normally a student wishing to receive both a bachelor's degree in political science, or economics and an MPP would take 40 additional credits after the baccalaureate and would spend six years at GW. The combined degree program offers students a challenging curriculum that substitutes 12 graduate-level credits for upper-division undergraduate courses. These 12 credits, chosen with advisor approval, are applied to the requirements of both the bachelor's degree and the MPP; this allows students to complete their bachelor's degree and Master of Public Policy with fewer total credits and in less than six years. 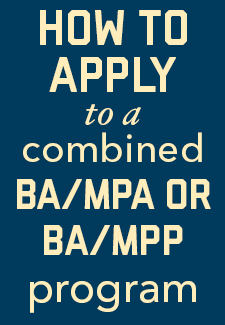 Students may apply for admission to the BA/MPP program when they have accumulated 75 credit hours. The application should be accompanied by a recommendation from a faculty member in either the Political Science or Economics Department, which will be used in the admission decision made by the director of the MPP program. Students who have maintained a satisfactory academic record may apply for admission to the MPP program during their junior year. It will be necessary for students to conform to the established requirements for completing an application. However, submitting GRE scores is optional and not required for combined degree students. Upon admission, students are granted 12 credits of advanced standing, leaving them with only 28 credit hours to complete the MPP degree.